It's not everyday that you see a wedding bringing one whole town to a halt and it’s more big of a deal when that town is Montreux, Switzerland. We recently came across this Indian NRI couple - Tanya Gangwani and Rajiv Verma whose wedding pretty much did this! While the poolside was decorated with marquee lights that read #TanysRaj and fresh petals, the rest of the area was decked in floral stings, beautiful floral arrangements, and even a concept bar. For their engagement Tanya opted for a embellished beige lehenga paired with a full sleeved blouse, featuring intricate work on it, Rajiv chose a wear a navy blue bandhgala with well-fitted pants. The decor of this lavish affair was bedecked with red roses and illuminated with striking chandeliers looking right out of a fairy tale. 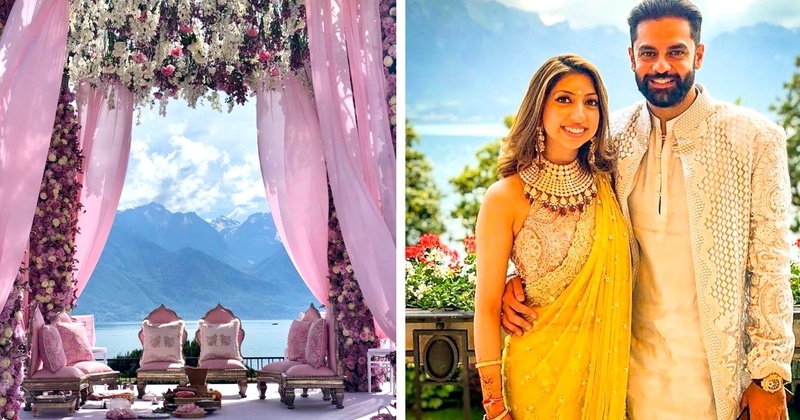 For the wedding and pre-wedding functions, the couple choose Switzerland for their destination wedding, muse to some of Bollywood's most popular romantic dance numbers of all time. With Snow-capped peaks behind you, palm trees in front, it comes as no surprise that Tanya chose to host her nuptials at Fairmont Le Montreux Palace. Flowers in ornate vases dotted the venue furthering the charm of the setup. Tanya took the traditional route and donned a red lehenga for taking the wedding vows while Rajiv looked dapper in a white achkan which he paired with a jade green saafa. The final event was the most awaited with the decor literally looking right out of a movie.